Oregon Women for Agriculture asks you to Vote NO on Measure 92 to avoid unnecessary confusion and costs. Oregon Women for Agriculture, an all-volunteer organization, believes that Oregon farmers and ranchers are committed to providing the safest, most wholesome, affordable and abundant food in the state, nation and world. Measure 92 does nothing to help attain safe, affordable and abundant food. Oregon Women for Agriculture urges your No vote. Measure 92 is unnecessary, confusing and costly to the consumer to label biotechnological products or processes. Biotechnology and genetic engineering have been in practice for thousands of years. We would not have the abundant food we enjoy today if we had not utilized these processes. Today’s biotechnology and genetic engineering is an advanced, precise method of breeding. Scientists have the ability to changing one gene and trait, instead of hundreds or thousands at a time to achieve a better tasting, more disease resistant and longer lasting product. Measure 92 is harmful to Oregon’s family farms. This measure requires a system of compliance that is more than just a label on a package. The increased regulations & costs go all the way down to the farmer. It would set a difficult, costly standard that would only be unique to Oregon. This would put Oregon farmers at a competitive disadvantage with the rest of country. 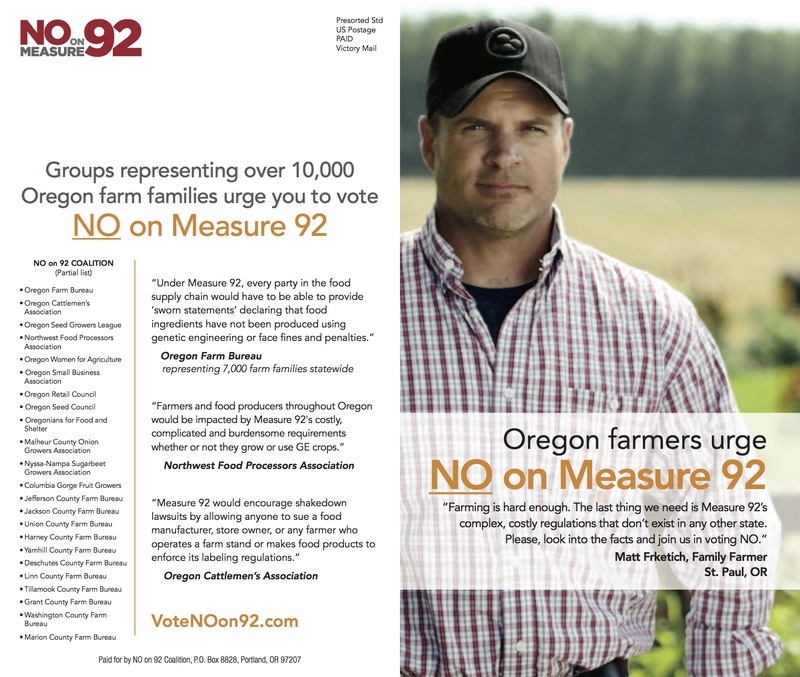 Oregon Women for Agriculture asks you to vote “No” on Measure 92. It is confusing, costly and burdensome to Oregon farmers and families and does nothing to increase consumer safety. Read Yamhill County OWA member’s perspective on Measure 92.